Black Lightning returns for a second season and begins by focusing on the consequences of what happened in last season’s finale. The best words to describe this episode are bleak and uncertain. Neither of those are a bad thing as the show once again demonstrates an ability to offer visceral social commentary through the lens of a show where super powers are the norm. No matter how fantastical this show may get there’s an undercurrent of realism in how the world functions. 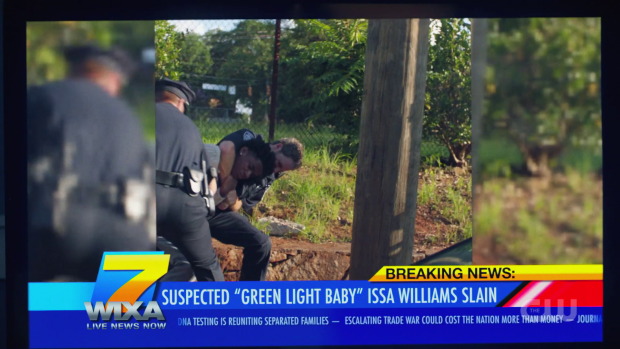 For example the idea of Green Light; a drug that gives the users super powers is a fantastical element but it exists with a relatable backdrop familiar to anyone who watches the news in modern times. Regardless of what the drug does and what crimes are being committed the message of there being a system at play that works against the people on the streets rather than for them resonates louder than ever. As the season begins Freeland is on the verge of tearing itself apart which is a massive escalation from the city that we saw last season. Yes there were issues and systemic corruption but there was also a sense of solidarity that allowed the community to function on some level no matter how tenuous it was. The super powered genie is apparently out of the bottle with the increase in metahumans creating a whole new definition of criminal activity that only manages to divide the community. Jeff sees it clearly because he recognises the signs predicting that people will soon lose sight of what is actually going on and blame metahumans for all of the lingering problems. It’s not something that can be fought and is absolutely a symptom of the loss of hope that has infected Freeland. Season 1 was very good at making Freeland itself a character in the show while expertly balancing the citywide issues with more intimate family problems and making them feel connected. Freeland is tearing itself apart with paranoia and uncertainty while the Pierce family struggle to hold it together after strengthening that familial bond at the end of last season. This is personified through Jennifer struggling to control her powers. They manifest in really interesting ways such as floating and glowing through the night. The contrast between beauty and terror works really well as a matter of perspective. On a visual level the glowing is beautiful for Jennifer losing control of herself when the abilities manifest is clearly terrifying to her. This is a significant difference to how Anissa’s powers manifested which was much more controlled by comparison whereas Jennifer no longer trusts her own body. She reacts angrily to what is happening to her and summarises the events of the finale of last season really well from her own perspective. She’s young and it’s really overwhelming for her to have to deal with things that are so far above what she can handle. Lynn is there to encourage Jennifer to commit to learning how to control her powers and figure out a way to live with them but she is not ready to hear it and accidentally lashes out to the point that she hurts Lynn. It’s completely unintentional and adds to the horror of the situation from her perspective while further confirming that she is not equipped to deal with what she is going through. 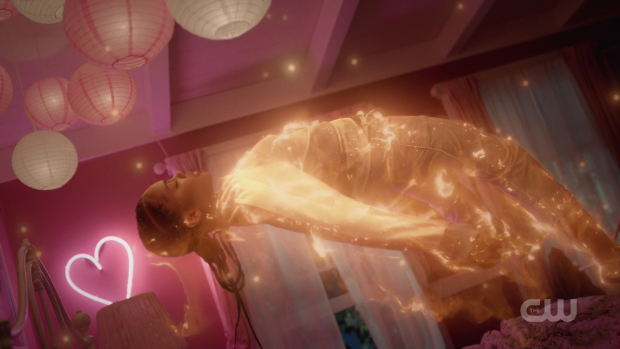 Later in the episode she forms a bubble that can’t be turned off until Jeff comes home and appears to absorb the energy that she has produced. It’s unclear what effect this has on Jeff if anything but it’s a great visual metaphor for Jeff supporting Jennifer as she learns what these powers mean to her. There is also a metaphor for middle age in this episode when Lynn mentions that Jeff’s abilities might be affected in the same way a man might develop erectile dysfunction as a result of advancing years. It’s one of the few light moments the episode has to offer and offers a great showcase for the rekindled Jeff and Lynn relationship but it also hints at a potential ongoing plot where Jeff’s powers become less reliable as time goes on. I could see Jennifer acting as something of a booster for his powers in the short term though even that might be harmful to him. Once again the powers are tied to the characters creating the contrast between youthful inexperience and ageing experience is fascinating to contemplate. Jeff has his own personal issues to worry about. There has always been a distinct separation between his role as the principal of Garfield and Black Lightning but the lines are starting to blur together and he finds himself removed from his post just to keep the school open. The options are that either the school closes or he goes; either way there is a loss to everything that he has tried to build as the school under the control of someone else might descend into the madness that plagues the rest of Freeland and stop being a safe place for the kids who need it most. It also represents a loss of his livelihood and having one of his accomplishments taken away from him. He also finds that his identity as Black Lightning compromised when Henderson manages to figure it out. The physics of the universe means that a disguised voice and a pair of goggles being enough for a disguise is just something we have to accept so the realisation has to be more clever than that. Henderson’s rationale for Jeff being Black Lightning works really well because it shows how intelligent he is. The attack on Garfield last season was what tipped him off as Jeff was nowhere to be found after the event which struck Henderson as unusual given his overall devotion to the school. 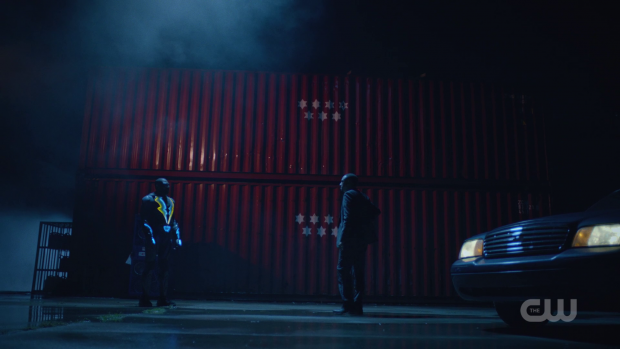 This encourages him to look at the night Black Lightning returned in more detail and see a connection that he didn’t see before. It’s a great scene that is wonderfully acted especially where Damon Gupton is concerned. Once his suspicion is confirmed he presents the appearance of a man who has no idea what to do with the information he now has. It’s clear he feels somewhat betrayed and Jeff now has to deal with uncertainty around whether Henderson will turn him in. His conversation with Lynn points out further implications of this with the impression that Jeff will struggle to take on more stress in his life. The discovery of the pods with people in them has caused a significant controversy that leads the people of Freeland to want to sue the government in order to gain access to those trapped inside them. It’s a big issue because it basically amounts to the little people taking on the system and what it realistically takes to do that. Jeff is a firm believer in the system running its course in this instance because any other action would be illegal and wouldn’t stick. Anissa doesn’t see eye to eye with him on this because she doesn’t feels that the system is rigged though takes his point and goes about solving the problem in her own way. The people need money in order to make any real impact so she goes about using her powers to steal money from the corrupt to fund this legal action. It’s an interesting interpretation of the situation and qualifies as a loophole within Jeff’s reasoning. This plot also provides some really well done action sequences. Another well done action sequence was Kara taking on Syonide and killing her. It’s wonderfully choreographed to show the skill of both characters. It was a little too abrupt considering how much of a threat Syonide has previously been but great while it lasted. Kara’s attempt to take on Tobias was entertaining enough though felt a little tacked on. I would have preferred more build-up to that particular confrontation. A strong opening to the season that sets a really bleak tone and summarises the main issues that will define at least the first few episodes. Freeland being on the verge of tearing itself apart with the people blaming metahumans for the problem is an interesting concept that shows how easily paranoia can spread within a society. 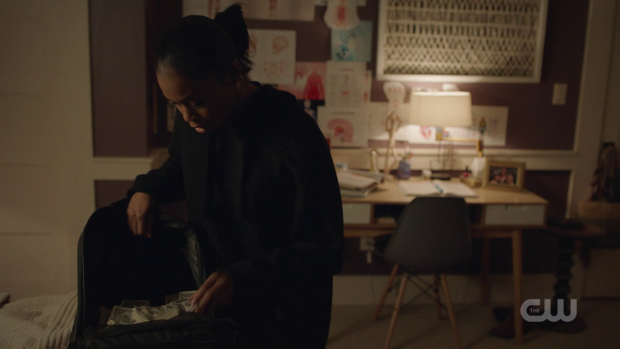 Jennifer dealing with her powers manifesting is well handled as well and shows how well Black Lightning juggles the societal and the personal. There are a lot of interesting implications to Jennifer’s powers and how they relate to Jeff. Jeff has to deal with a number of personal issues such as Henderson finding out that he is secretly Black Lightning which carries with it another person in on his secret to worry about as well as a great deal of uncertainty around what Henderson will do with the information. It’s a great scene that is well performed by the two actors showing the weight of this reveal. Jeff removing himself as principal of Garfield in order to keep it open is another powerful moment as it represents the loss of one of the few safe places in the city as well as a significant accomplishment on Jeff’s part. Anissa interpreting Jeff’s talk about working within the system as needing to steal money from the corrupt to help the people find justice is an interesting idea that allows for great action sequences. Kara taking on Syonide was similarly impressive as was her confrontation with Tobias though that felt a bit too sudden and tacked on.